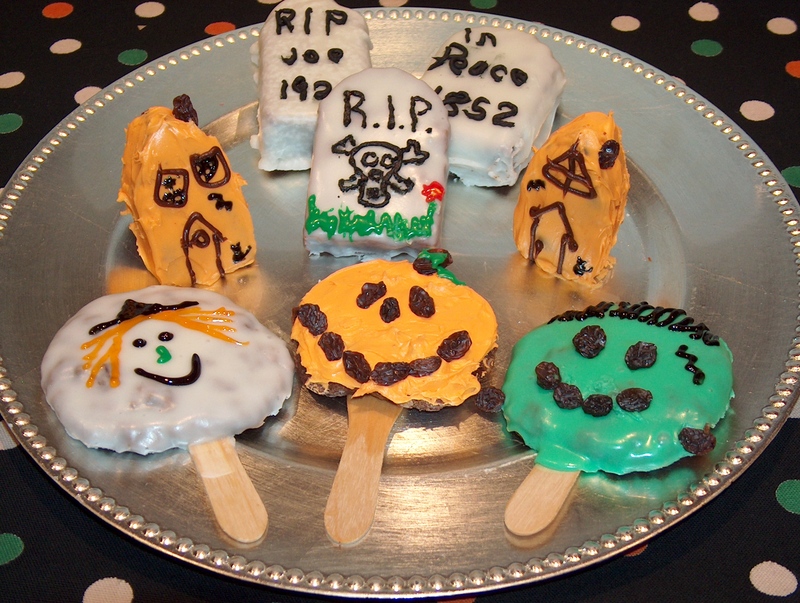 and how about chocolate-y tombstone brownies too! and some Apricot Snack Mix for your favorite boys and ghouls. And of course, carve a pumpkin. Check out Rita’s oddball pumpkin carving for a twist on the traditional jack-o-lantern face. Makes about 32 cookies Prep time: 15 minutes Bake time: 24 minutes Plus decorating time. Heat oven to 350°F. Grease cookie sheets or line with parchment paper. Combine butter, brown sugar, eggs and vanilla; beat until well blended. Stir in melted chocolate, then flour and baking soda. Mix well. Mix in oats and raisins. Space sticks 4-inches apart on baking sheet. Drop a rounded 2-inch ball of dough onto the end of each stick. Butter the bottom of a glass, dip in flour, and gently press cookie dough to 1/2-inch thickness. Repeat with remaining dough. Bake at 350°F 10-12 minutes until slightly puffy and firm on the edges. Cool on pan 3 minutes. Remove with spatula to cool on wire racks. Melt 1/2 cup butter in a medium saucepan. Add 1/4 cup milk. Gradually whisk in 1 pound (about 3-1/2 cups) powdered sugar. (Sift sugar first if it is very lumpy.) Stir vigorously with a fork for 3-4 minutes until mixture turns white and opaque. Mixture should be thick, smooth and pour able; add more milk or sugar if needed. Working quickly before glaze stiffens, generously spoon glaze over cookies allowing excess to run off edges. Let set until dry to the touch. Decorate. 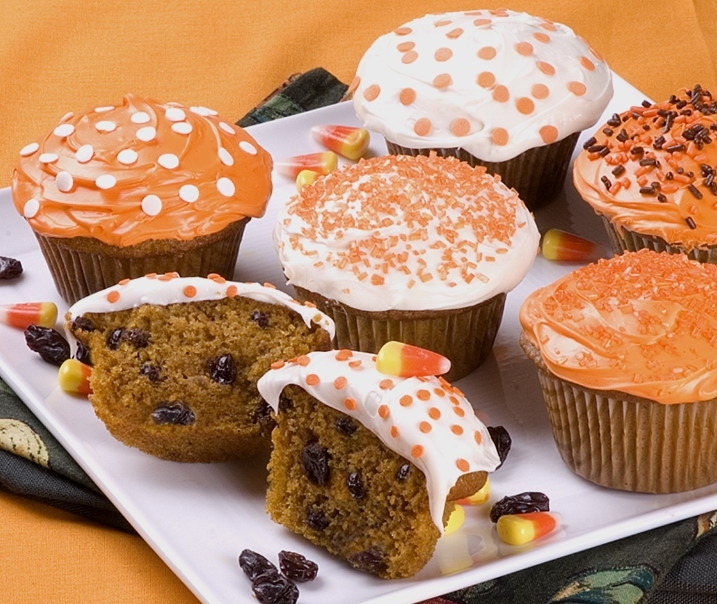 Short-cut method: Add food coloring to purchased frosting. Spread on cookies. 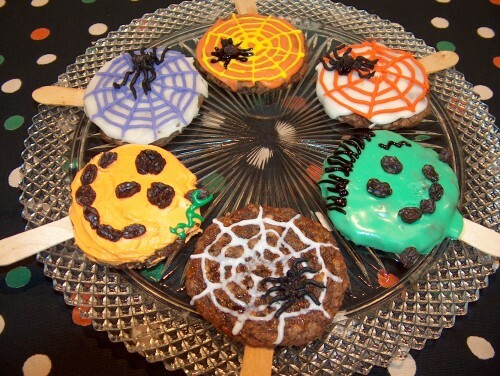 Use icing tubes to pipe on spider webs. 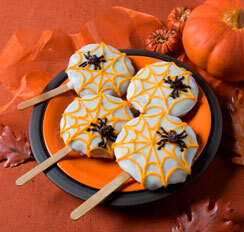 Make a spider using a raisin for the body and icing for the legs. You can use this dough for a slice-n-bake cookie. Shape dough into a 1-3/4 inch diameter log. Wrap in plastic and refrigerate up to one week, or freeze for longer storage. Slice 1/2-inch thick rounds. Place on baking sheet on sticks and bake as directed above. Original recipe for Sun-Maid Growers. Top cookies photo by Susan DeVaty. Cupcakes photo by Kelly Burgoyne. oh yes, dates would be quite juicy roaches!